What I am becoming ? To be frank, my life is quite messed up. I feel relaxed only when I am writing. The time spent in forming words into sentences and throwing my feelings in the mix is the best task I love doing. Deep down I completely hate every moment except when I am writing. This is purely my instinct and what I am becoming. Author Mayank MishraPosted on April 6, 2016 Categories futuristic, life, Metaphysical, Metaphysics, Philosophy, selfTags becoming, future, life, moment, past, writeLeave a comment on What I am becoming ? 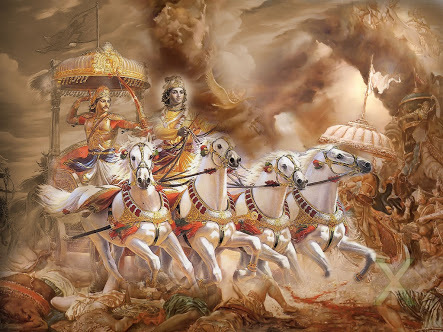 The book of Gita is full of wisdom, which is highly acclaimed by management gurus all around the globe, CEOs of gigantic corporations have regarded it as the book of genius management formulae. I am not here to talk about any management secrets however I will dwell upon the most central message imparted in it. The Lord says in the Gita that one should be detached from the result of whatever one does, when we are not worried about the fruit of our work only then we can put our best efforts into it. The rule is simple, focussing on the task at hand and not on the results which this task will bring in the future only diminishes us in our capacity to perform in that task. The sermon by Lord Krishna simply invokes us to live in the present, let the dead past bury its dead and work in this moment without dreaming of the future. If we dig deeper into this message we understand that we always neglect the present moment and it is this hour which requires our utmost attention. Not worrying about the fruits of our work enables us to work without worry or expectations, thus giving the best results always.